Apparently, we Canadians used up all our hockey karma in Sochi. If the season ended today, the nation would send only one team to the playoffs for the first time in more than four decades. The Expectations: They’d be awful, and probably challenge for last place overall, but at least Brian Burke would be entertaining. The Reality: Pretty much exactly that, actually. Burke’s been a little off his game in the sound bite department, but the haircut thing made up for it. 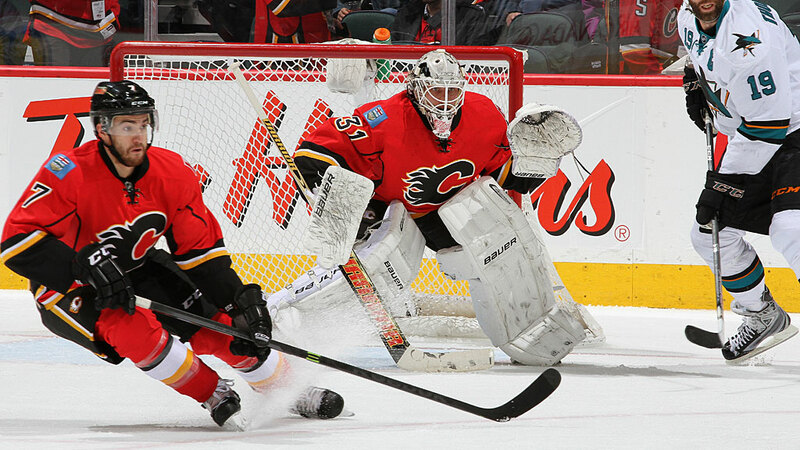 What Went Wrong: For years, the Flames were the classic example of a team that couldn’t accept reality. After making a surprising run to within a game of a Stanley Cup championship in 2004, they continued to insist they were contenders, despite not winning a playoff round in the salary cap era. By the time they finally hit the reset button with last season’s trade of Jarome Iginla, it was too late to reap much of a return on their aging assets. Now they’re left with a handful of good young players, a few sturdy veterans, and not a whole lot else. Firing Squad: GM Jay Feaster already walked the plank back in December. It’s a minor surprise that coach Bob Hartley has made it through the season, but Burke seems to like him, so he’s probably safe until a new GM is in place. It sounds like that may not happen until after the draft, which would suggest Burke already has someone from another organization in mind. Ominous Sign: Despite basically writing off the season, the Flames look like they may wind up picking fifth or sixth in a draft most experts think is thin outside of the top three or four picks. Ray of Hope: They’re finally rebuilding. It’s going to be a long process, but they’ve started down the right path, and short of building a time machine back to 2009, that’s really all they could do. And while this year’s team isn’t good, it’s been kind of fun to watch. Also, between Burke still refusing to cut his hair and the Boring Sean Monahan Twitter account, at least the Flames’ comedy potential is off the charts. So there’s that. YouTube Video to Cheer Up Flames Fans: This feels like it was five days ago. The Expectations: Last year’s team was ravaged by injuries and still made it to the second round. Keep them relatively healthy for a full season, and the Senators looked like a borderline Cup contender. The Reality: They haven’t just been relatively healthy, they’ve been the healthiest team in the entire league by a good margin. And … they’ve been awful. They won’t make the playoffs, and have dropped as low as 26th overall. What Went Wrong: We could come up with all sorts of narratives, ranging from complacency to a lack of leadership after the franchise’s bitter parting with captain Daniel Alfredsson. But the biggest key is much simpler: goaltending. Last season’s team was largely powered by the excellent duo of Craig Anderson and Robin Lehner. The pair was so good that the Senators felt safe trading third-string Ben Bishop to the Lightning for Cory Conacher at last year’s deadline. One year later, Bishop is a Vezina frontrunner, Conacher was just lost on waivers for nothing, and Anderson and Lehner have both struggled. It’s one thing to expect some regression to the mean, but Ottawa currently sits 29th in goals-per-game allowed. Nobody saw that coming, and it’s torpedoed the Senators’ season despite a top-10 offense. Firing Squad: GM Bryan Murray is safe, and you’d assume coach Paul MacLean would be, too — after all, he’s the reigning coach of the year. But owner Eugene Melnyk has a history with assistant coach Dave Cameron and reportedly wanted him to get the top job in 2011. (Murray went with MacLean instead.) The Senators recently shuffled Cameron’s duties, an odd late-season move that doesn’t appears to have been MacLean’s call. Would Melnyk use a disappointing season to force a coaching switch and get his handpicked guy in place? Let’s just say he’s done stranger things. Ominous Sign: They’re not even doing well in terms of cost-per-point, and that’s the most important statistic of all! Ray of Hope: The Senators really do look like kind of a mess right now, from ownership on down. Then again, everyone has been completely wrong about this team for two years running. Maybe being written off now is a good omen. YouTube Video to Cheer Up Senators Fans: Don’t act like you don’t already have it bookmarked. The Expectations: A year after finishing first in the Northeast Division (but getting blown out in the playoffs), the Canadiens were expected to compete with the Bruins for top spot in the newly formed Atlantic. The Reality: The competition with the Bruins never really happened — Boston has basically run away with the division. But Montreal has all but clinched a playoff spot, and seems locked into a first-round matchup with the Lightning. 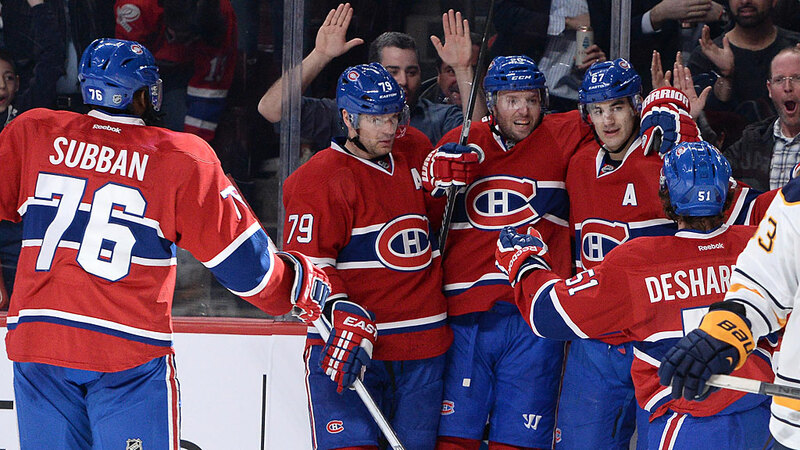 And the Habs even beat the Bruins on Monday to snap Boston’s 12-game win streak. They’re Canada’s only good team. What Went Wrong: Not much, and I can’t tell you how annoying that is to the rest of the country. Firing Squad: Barring another playoff meltdown, it’s hard to imagine them making a change. Which is ironic, since Habs fans complain about their coach more than the just about any other team on this list’s fans do. Ominous Sign: Every second columnist in Canada is already working on a “Are the Montreal Canadiens now Canada’s team?” piece, because they don’t understand how sports works. Ray of Hope Fact That Makes Me Throw Up in My Mouth a Little Bit: The last time only one Canadian team made the playoffs was all the way back in 1973. That team was the Canadiens. They won the Stanley Cup. YouTube Video to Cheer Up Fans of Every Other Team: You’re next, Carey. The Expectations: Take a slight improvement over last year’s ninth-place finish in the East, balance it out with a move to the tougher Western Conference, and you wind up with another year spent hanging around the fringe of the playoff picture. The Reality: As low as the expectations were, the Jets have still managed to disappoint. After winning their first two games, they stumbled through the rest of October and were basically out of the playoff race by mid-November. That was enough to cost coach Claude Noel his job, as he was replaced by Paul Maurice in January. What Went Wrong: We seem to harp on this all the time, but the goaltending just hasn’t been good enough; Ondrej Pavelec’s .902 save percentage ranks him just 36th in a league of 30 teams. You need to score plenty of goals to survive that sort of performance over a full season, and the Jets just don’t have the offensive talent to do it. 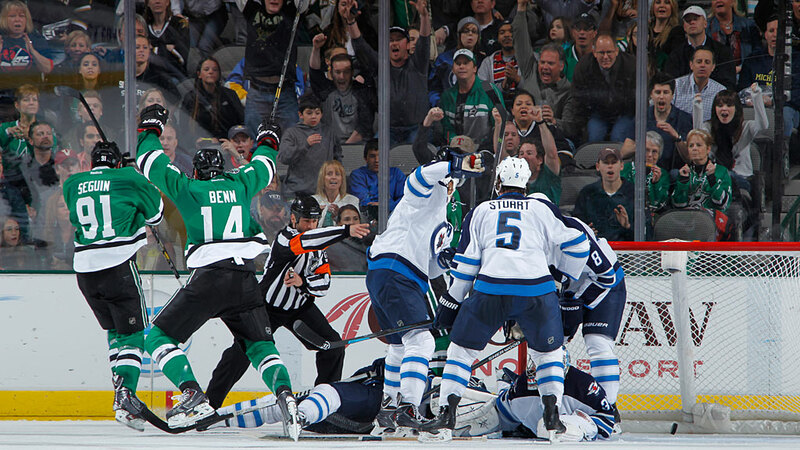 Still, the team was able to claw back into the playoff race under Maurice, and the Jets seemed like they could make a dark-horse run until rookie Mark Scheifele went down in the first week of March. That contributed to a decision to stand pat at the trade deadline instead of bringing in rentals for a playoff push, which was probably the right call for the long term but was basically a white flag on the current season. Firing Squad: Maurice obviously won’t be fired, but he has a contract only for this season and hasn’t discussed an extension yet. You’d assume he’ll be back, but it’s not a sure thing. GM Kevin Cheveldayoff got an extension through 2018 before the season began, so he should be safe. Ominous Sign: We already knew the Blues and Hawks would be great. But with a very young Avalanche team making a surprise leap to the top of the standings and the Wild and Stars showing flashes, the Central suddenly feels like an awfully tough division to ever crack the playoffs in. Ray of Hope: The team initially played well with Maurice behind the bench, winning its first four and eight of its first 10 under his leadership. The Jets have cooled off since then, but it was an encouraging sign. They’re still reasonably young, and Scheifele looked like a keeper before he was hurt. YouTube Video to Cheer Up Jets Fans: Sure, you’re the Jets, but at least you’re not these Jets. The Expectations: The Canucks came into the season as a bit of a question mark. 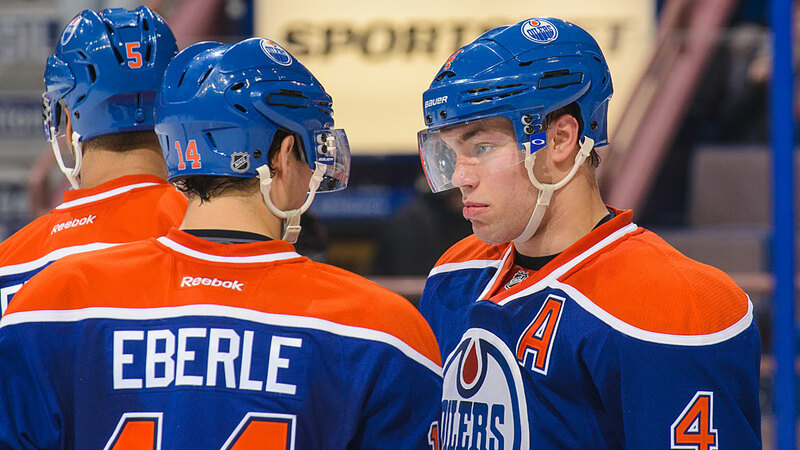 The core was getting old, and they hadn’t won a playoff round since their 2011 Cup run. But they were just one year removed from back-to-back Presidents’ Trophies, had finally settled their goaltending controversy, and had brought in coach John Tortorella to light a few fires. They weren’t at the Blackhawks’ level, but they were right in the mix of the West’s second tier. The Reality: They started off reasonably well, and an excellent December had them in good shape heading into the new year. But they’ve gone just 11-19-3 since then to fall out of the playoff picture. Both Sedins have been hurt, Alexandre Burrows stopped scoring, Alex Edler can’t catch a break, and Ryan Kesler asked for (but didn’t get) a trade. And about that settled goaltending controversy? Oops. What Went Wrong: It seemed like a good idea at the time, but in hindsight, it sure looks like Tortorella was the wrong choice for Vancouver. The injuries haven’t helped matters, though it’s not exactly a surprise when older players don’t play a full season. And they can’t score, ranking ahead of only Buffalo and Florida in goals per game. 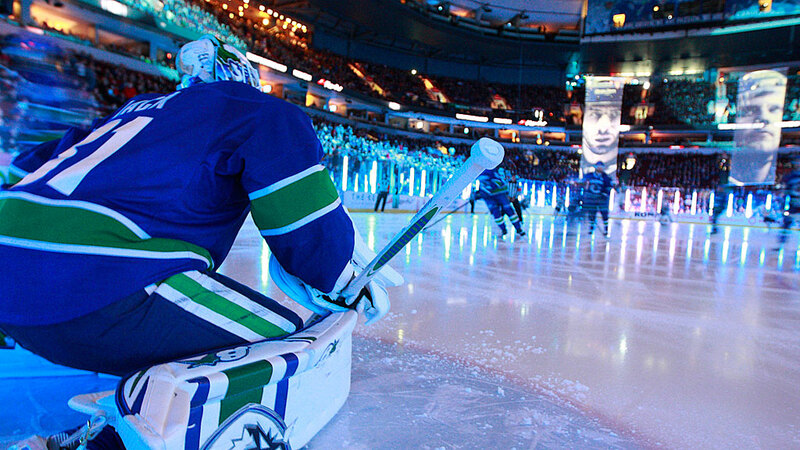 Firing Squad: Canucks fans have the knives out for GM Mike Gillis, who mishandled the goaltending situation badly, but there are reports that ownership has his back. If Gillis goes, his replacement will have to make the call on Tortorella, who’s had a rough first year but came into the job with a great résumé and a Cup ring. Ominous Sign: New starting goalie Eddie Lack hasn’t exactly looked fantastic since the Luongo trade. Granted, that’s a 11-game sample, which isn’t even close to enough to evaluate a goaltender, so we can probably just ignore it. But the 26-year-old rookie will be under plenty of pressure in a town that’s had eight years to get used to consistently excellent goaltending. Ray of Hope: There’s actually more than just a ray here, because fancy stats tell a story of a reasonably good team (51.6 percent Fenwick across all situations, and 52.3 percent 5-on-5 close) that’s suffered from some unusually bad luck (a 98.8 PDO overall). The Canucks’ days of chasing the Presidents’ Trophy are over, but if they can stay healthier next year, they could absolutely be right back in the playoff mix. YouTube Video to Cheer Up Canucks Fans: This guy was good. The Expectations: That depended on whom you asked. The fancy stats crowd said the Leafs were awful and predicted doom. The old-school guys saw a young team supplemented by the addition of playoff-hardened veterans that was ready to take the next step. What Went Wrong: As it turns out, both sides were right, but one seems to have been more right than the other. The analytics crowd pointed to the team’s terrible possession numbers in 2012-13 as a giant red flag, and the Leafs have been somehow even worse in that category — they’re on pace to give up roughly 650 more shots on net than they take this year, which is basically unheard of. The old-school guys figured the Leafs could mitigate that through timely scoring and excellent goaltending, and to some extent they have (mostly the latter, courtesy of newcomer Jonathan Bernier). Despite never seeming to have the puck, the Leafs were still winning enough games to be solidly locked into a playoff spot just two weeks ago. But they’ve lost six straight since then, and are now on the outside looking in after spending Tuesday night being taken to school by the far superior Blues. And even their most optimistic fans are starting to accept reality: When they’re not having their mistakes disguised by Vezina-quality goaltending, the Leafs look downright awful. It’s too early for a victory lap quite yet, but let’s just say the advanced-stats guys are revving the engine. Firing Squad: This will come down to new MLSE CEO Tim Leiweke, who talks a big game about accountability and culture change, but hasn’t backed it up yet when it comes to the Leafs. GM Dave Nonis received a curious five-year extension last summer, so you’d think he’s safe. 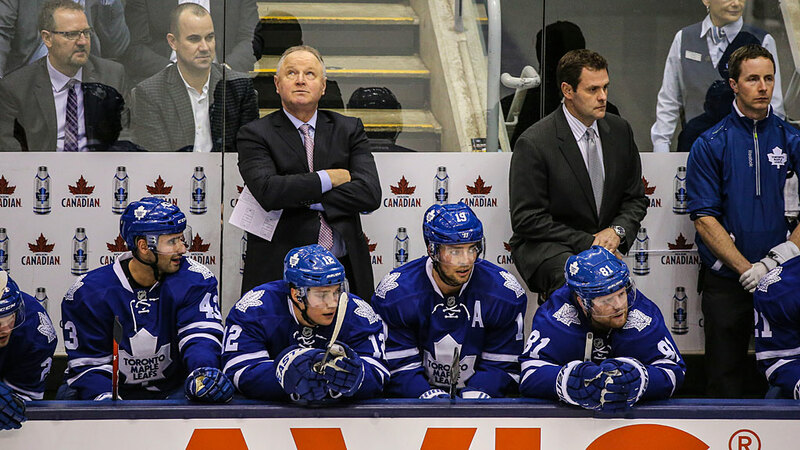 Coach Randy Carlyle could be a different matter, especially if the team misses the playoffs. Nonis didn’t hire Carlyle, so making a coaching change is basically his own personal get-out-of-jail-free card, and he may not want to play it quite yet. Then again, Leiweke might not give him a choice. Ominous Sign: The team has nothing in the way of elite prospects, few roster players who haven’t already hit their peak years, a veteran core signed to expensive long-term contracts that has the Leafs right up against the cap, and no compliance buyouts left. As obvious as it now is that the roster needs major improvement, it’s hard to see where it’s going to come from. Ray of Hope: Hey, it’s not like other teams haven’t had tough stretches, then miraculously turned the corner. Like, just to pick one example at random, the Anaheim Ducks, who had been struggling for years until they suddenly emerged as an elite team back in December 2011. It’s really been night and day for those guys. Huh. Wonder what changed. YouTube Video to Cheer Up Maple Leaf Fans: As if there were any doubt.